We hear a lot about partisan gridlock in Congress these days, so it’s nice to hear about times when Congress (or at least the House of Representatives) can lay politics aside and just get the job done, as they did in 2009 when they declared March 14 National Pi Day. Adam’s math teacher has taken the resolution to heart, and spent a couple of weeks in March teaching his class lots of formulas involving π, including both surface area and volume of spheres, cones, and cylinders. Adam asked for some help on that cylinder worksheet, and I found that the poor guy had actually been doing the multiplication of π by hand, instead of just doing like you get to do once you hit pre-calculus and leaving all the answers in terms of π. Furthermore, he was doing them by hand, and worst of all, he was doing it twice in the formula (πdh)+(2πr2). The first thing I did was convince him that (πdh)+(2πr2) was equal to 2πr(h+r), so at least he’d only have to multiply by π once. 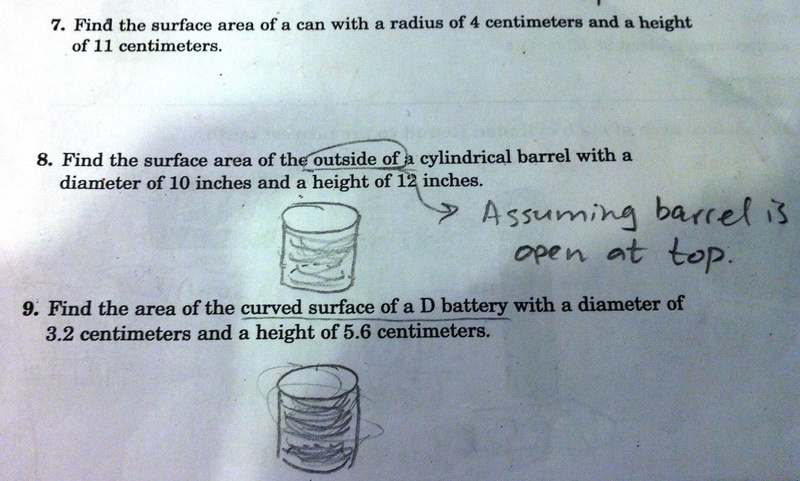 the surface area of the outside of a cylindrical barrel with a diameter of 10 inches and a height of 12 inches. Just looking at the words, I figured Adam would have to start by finding the surface area of the side: 120π square inches. Then there would be the ends to consider. Assuming the thickness of the side was negligible, the surface area on the inside would be the same as on the outside. So two ends, each with a surface area of 25π square inches. In other words, the exact same procedure as finding the surface area of any cylinder. So why did the worksheet creators go to the trouble of asking about the outside of a barrel, when the outside and inside surface area were going to be the same anyway? That seemed like a pretty clear violation of the Maxim of Relevance. surface area of a can with a radius 4cm and a height of 11cm. curved surface of a D battery with a diameter of 3.2cm, and a height of 5.6cm. And with that, the task in problem #8 became clearer. In #7, you had to find the complete surface area of a cylinder; in #9, the surface area of a cylinder without its top or bottom. If #8 were about a cylinder with a bottom but without a top, that would make a nice progression, and I was convinced that that was what the worksheet creators had been after. At the end of a course of eight weekly lectures on drug abuse and how to resist peer pressure, he resisted the peer pressure (and teacher pressure) to write an essay that concluded with his pledge not to abuse drugs. He wrote that the program had provided some good information, but could be improved by not glossing over issues like medicinal marijuana, and that although he didn’t plan to abuse drugs, it wouldn’t be because of a pledge that was involuntary and therefore meaningless. According to Doug, it was the only essay to get a round of applause from the students. They laughed in disbelief. You just never knew what kind of random stunt Doug would pull. But after a minute or so their amusement turned to concern. I had been less than happy when Doug came home with only one of his new green gloves on the very first day he wore them. Good for him for taking the initiative to look for it at the Lost and Found. And way to violate the Maxim of Quantity for fun and laughs! Over at Visual Thesaurus, I have a column about how and when congressman, which on its face would seem to be synonymous with member of Congress, came to refer to members of the House of Representatives to the near-exclusion of senators. I was reminded of it a few weeks ago when I heard someone on NPR talk about a low-population Western state’s “lone congressman“. Wait — the fewest congressmen (or congresswomen) any state should have is three, right? Two senators and one representative. As is often the case, it turns out that this usage been going on for a long time, in this case maybe even for as long as there has been a U.S. Congress, since the word congressman predates it. But these days, congressman is even less appropriate than it was a hundred years ago, since now there are women in the House (not to mention the Senate). So the feminine equivalent congresswoman has been created, and to refer to either congressmen and congresswomen, the supremely awkward congressperson (first citation in OED, 1972). This word should never have been created. (Note: I’m not taking the untenable position that it’s not a word. But I still say it was stupid to create it.) If you want to talk about a representative, why not just say “representative”? Or, if you want a word that can refer to either a senator or a representative, member of Congress will do the job less awkwardly, and without the confusion that’s bound to occur when people interpret congressperson to mean “representative”. And what about more than one congressperson? Congresspersons? Congresspeople? In the VT column, I attributed the constrained meaning to Q-based narrowing, which I’ve also talked about in these posts. However, representative also has semantic and phonetic factors working against it. On the semantic side, congressman/-woman does have an advantage over representative: It refers to a member of Congress, as opposed to some other kind of representative. Anyone who represents someone is a representative, but only a representative in Congress is a congressman/-woman. Phonetically, representative is a troublesome word because it has an [r] in a consonant cluster beginning with a bilabial stop, i.e. [p]. Furthermore, this [pr] cluster is at the beginning of an unstressed syllable, and these circumstances almost guarantee difficulty in pronunciation. Look at what’s happened to Feb(r)uary, p(r)erogative, and lib(r)ary. (Nancy Hall at California State University at Long Beach has done some research on this “short-distance r-dissimilation,” but it’s not published yet. But if you’re curious, you could take a look at some of her other work in progress, on long-distance R-dissimilation, in words like pa(r)ticular and gove(r)nor.) There’s also the fact that representative has five syllables to congressman‘s three, or congresswoman/-person‘s four. Finally, there’s the decision you have to make when pronouncing the nt in the middle. Do you do a nasalized flap (scroll down), or carefully pronounce the [nt]? I’ve found that the term “congressman” can refer to either a Representative or a Senator depending on the local parlance of different areas in the US. Back in New England where I grew up, for some reason we always talked about “congressmen and senators.” When I lived near Wasington, DC, you tended to hear people refer to the Representatives as just that. Out here in the western US, everyone seems to speak just of “congressmen” in the broad term. What’s odd around here, however, is that when you hear people addressing the politicians directly, you hear “Mr or Ms So and So” for Representatives and “Senator” for Senators. Different traditions, I suppose. Personally, I find using the term “Representative” all the time to be a little too officious and that “congressman” (or “-woman”) just feels a little more neighborly. i don’t know what to say. Where I am (see below), “Congressman/woman/person” means someone in the House — period. It does not mean or include “senator” — ever. I live three miles or so from where these people hang out (when they’re not fund-raising), and maybe out there in Podunk or Peoria there is someone who, hearing the word “Congressmen” or the phrase “Members of Congress,” allows for the possibility that some senators are meant, but that’s not what the words mean where the people described by those words assemble. Sorry, both are, by the very people to whom the title applies. And here’s a dare: Find anything in the Congressional record that clearly uses “congressman” or “congressperson” to mean or include senators. Okay, senators and congressfolk are not the final word on English usage. (Thank God.) But they use the labels for their positions the way I use those words, and until I am shown something (other than unsupported opinion) that indicates I am wrong, I’m going to keep insisting that I’m right. Well, of course you can. And any knowledgeable American speaker of English will wonder what you are trying to convey. Forgive my asking, but are you a knowledgeable American speaker of English? If so, what has led you to think that you can call a Senator a congressperson and have anyone understand what you are saying? I guess it just goes to show that word meanings, like Constitutional rights, fade when they’re not exercised. The top headline on the front page of The Columbus Dispatch today was “Janitor’s desperation turns deadly at OSU”. The subhead read: “Nathaniel Brown lashed out by killing his boss, Larry Wallington, and wounding supervisor Henry Butler Jr. before killing himself”. Early yesterday, Brown walked into the Ohio State University building where he’d worked since October and killed his supervisor, shot another boss and then turned the gun on himself. I’ll leave it as a research project for some inspired reader to go through the archives year by year to find out when turn the gun on [one]self started to convey the meaning of actually successfully committing suicide with a gun. The good news: Adam has picked up some more of the language of his peers. The bad news: It’s the adjective retarded. The good news: He’s not using the word to insult people. The bad news: He’s using it to describe things that only someone with mental retardation could appreciate, as in That’s retarded! This usage makes sense only with the support of a presupposition that mentally retarded people like things that other people find stupid, but that kind of argument is going to be hard to explain to a kid. This is the same kind of semantic shift as happened with gay — from describing a person to describing something that only that kind of person would like, with the hearer implicitly asked to agree that gay people like things that other people find stupid. There are kids for whom this connection is so attenuated that they refuse to believe it, saying, “It’s not insulting to say something is gay! You’re not insulting a person, you’re just saying the thing is stupid”, and I’m sure I’ll hear the same kind of defense of retarded as a thing-describing adjective.